Steve Waite and Lee Sinclair at the launch of the Atlantis Beach estate. 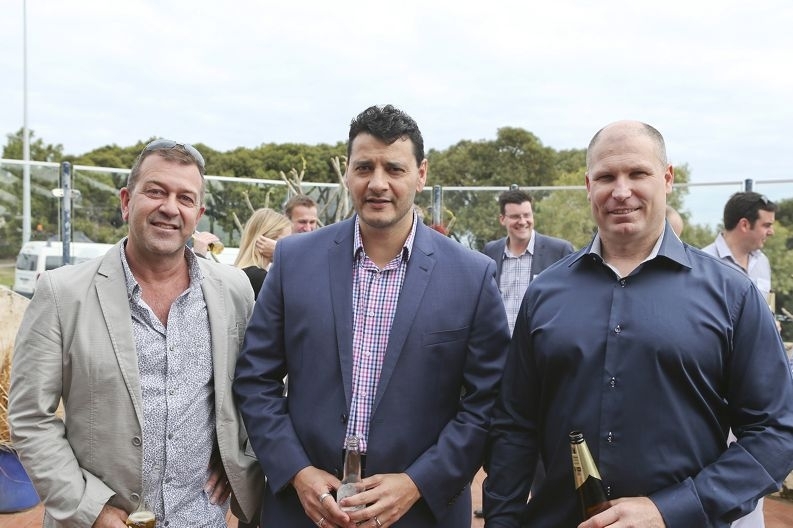 Representatives of five building companies attended a launch for Atlantis Beach at Oscars and Sons restaurant on September 23, a day before the packages became available. Atlantis Beach project director Jarrod Rendell said they had allocated the entire first precinct to a partnership with ABN Group (Homebuyers Centre), Residential Building WA (Smooth Start), Summit Homes Group (Easystart and New Generation), Home Group WA and Scott Park Group (Redink Homes and B1 Homes). ‘Atlantis Beach will offer larger average lot sizes in the initial precincts which will help to differentiate the project from other estates along the northern beaches,’ Mr Rendell said. Mr Rendell said packages would start at $297,500, with most between $340,000 and $370,000 for the lots within 1.2km of the beach. ‘In the first two precincts of Atlantis Beach we have deliberately set out to offer young and growing families a roomy back yard and in most cases the opportunity for a swimming pool or that backyard cricket pitch,’ he said. Mr Rendell said they planned to invest in Two Rocks. ‘We will continue to work closely with them and our established builder partners to create a high quality development and rejuvenation of the existing township amenities,’ Mr Rendell said.